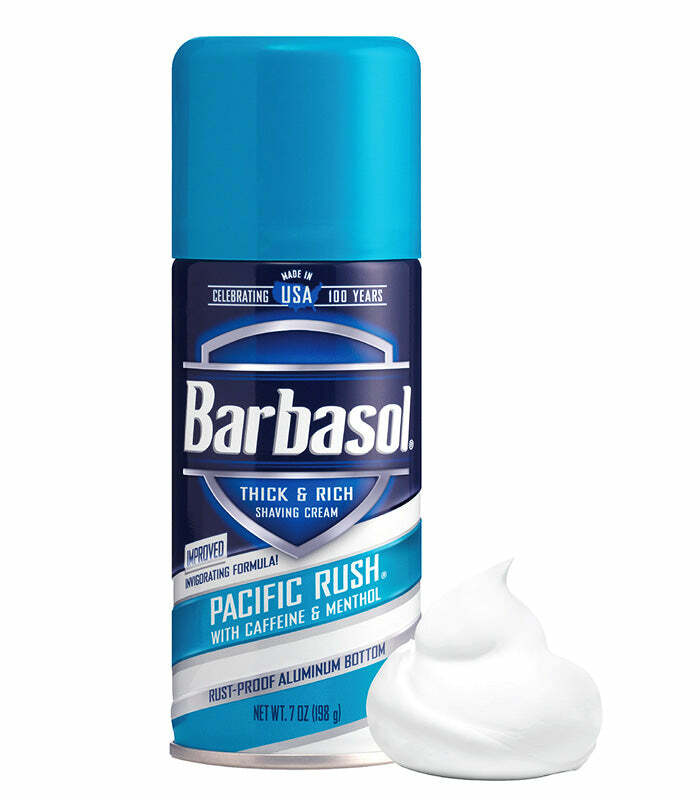 Barbasol Pacific Rush Shaving Cream is specially formulated with caffeine and a lively kick of invigorating menthol to help you feel the rush. The premium Close Shave® formula, with quality ingredients, produces a rich, thick lather and exceptional razor glide. Barbasol Shaving Cream gives you the confidence that comes from a close, comfortable shave. For an even closer and more comfortable shave, use with Barbasol razors. Use gentle strokes with a fresh Barbasol razor to avoid irritation. Water, Stearic Acid, Triethanolamine, Isobutane, Laureth-23, Caffeine, Menthol, Sodium Lauryl Sulfate, Propane, Fragrance. Warning: Contents under pressure. Do not puncture or incinerate. Do not heat for any purpose. Do not store at temperature above 110°F. Keep out of reach of children. Avoid prolonged exposure to water. Discard can if rust forms. The rich, thick lather preps and softens even the toughest facial hair to deliver exceptional razor glide. By protecting skin while you shave and minimizing irritation, our specially formulated shaving cream gives you the confidence that only comes from a close, comfortable shave. Barbasol believes in purchasing American-made materials and equipment whenever they’re available. We’re proud to say that 100% of Barbasol Shaving Cream products are made in America. For the confidence that comes with a close, comfortable shave, use with Barbasol Razors. The Close Shave® Technology on each razor delivers ultra thin, open flow blades to allow for easy cleaning and long blade life.